Recently, I've been the recipient of two very nice awards from two thoughtful bloggers and, now that the A to Z Challenge is over, I'd like to recognize them. 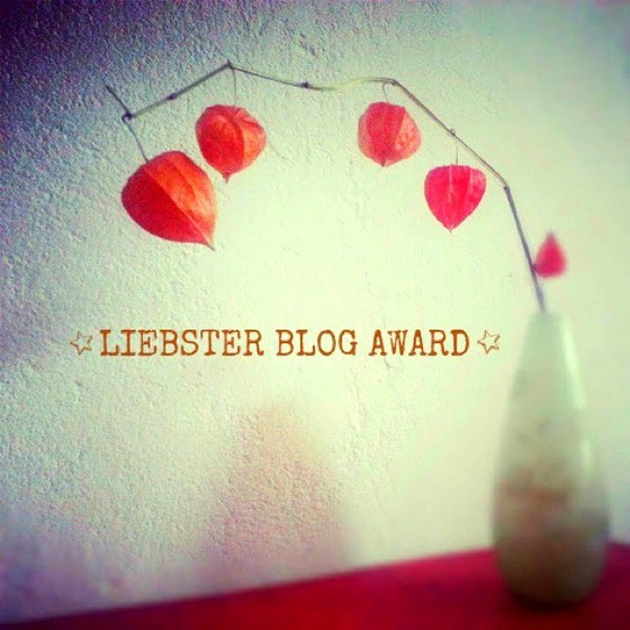 The first is the Liebster Award. The lovely and talented Nicki Elson over at Not-So-Deep Thoughts was kind enough to give me this one, so a big "Thank You!" to her. So now, in keeping with the spirit of the award, I'm going to let you all in on 11 "fun" facts about yours truly, answer Nicki's questions, come up with some of my own, and then pick some well deserving bloggers to pass it along. 1. Apparently I used to talk... a lot....when I was younger. My dad had an aunt who talked a lot and he used to always tell me that he was going to lock us in a room together and see who could out talk the other. 2. My ambition, when I was ten years old, was to become a syndicated cartoonist. 3. My very first "crush" was Melody from the Josie and the Pussycats cartoon. 4. I grind my teeth so badly, at night, that I have to wear a mouth guard. 5. I used to suffer from severe migraine headaches until I reached puberty. 6. I have a fitness goal to have six pack abs in a year. 7. I went through a phase where I preferred to date only tall women. I dated a girl 5'11" and the one after that was 5'10". My wife is 5'5"
8. My first "online experience" was not via a computer, but via WebTv. 9. I love Native American culture. 10. If I had to do it all over again, I would have tried to become a professional wrestler. 11. I weighed 9lbs 13ozs at birth....I was a chunker! 2. If you were a comic book superhero, what wold your name be? It would have have to be something that wouldn't give away my powers or abilities (not that I've ever given this any thought or anything ahem)...I'd keep it sort of generic....something like The Marauder or The Ranger....something like that. 3. What are the toppings on your dream hamburger? Mayonnaise, mustard, onions, pickles, tomatoes. Sometimes Frisch's Big Boy tartar sauce in place of mayo/mustard. It's good....I promise! 6. Which Disney character is most like you? Darkwing Duck! 8. You can only choose one: would you rather write a book that's a best seller or a book that's highly acclaimed? A best seller....that way I'd have the time and means to write other books and, maybe, one of those could be highly acclaimed. 9. What's your biggest pet peeve when it comes to grammatical mistakes in a published book? The dreaded "Your" and "You're" debacle. 10. If you could live permanently in any decade, which would it be? Probably the 1940s. 11. Who's your favorite fictional romantic couple? Nick and Nora Charles from "The Thin Man" films. 1. Who would you get to play you in the movie about your life? 2. Aliens land and demand that you 'take them to your leader'. Who do you take them to? 4. Big Mac or Whopper? 5. The government approaches you with the chance to gain superpowers, but you have to fake your own death and never contact your family/friends again. Do you do it? 8. Favorite book from your childhood? 9. Do you think it's ever 'too late' to find love? 10. How's your steak cooked? Rare, medium rare, medium, medium well, well done? 11. What feature do you find the most appealing in a potential mate? 1. The Bird's Nest: Jaybird never ceases to make me laugh and blogs like hers are the reason I started getting into blogging in the first place. I like reading about people's lives...both the good and the bad. And, in Jaybird's case...the jacked up! :) Her A to Z was a very entertaining hodgepodge and I mean that in a good way! 2. Alex J. Cavanaugh: The Ninja Captain had a pretty ambitious theme going. He featured a blogger that corresponded with a movie that started with the day's letter. And, on top of that, he put a song to the person and movie. All this while still doing his "Ninja News" stuff and throwing in book shout outs. If nothing else, you have to hand it to him for the sheer scope of his theme and he managed to pull it off flawlessly. 3. Manzanita over at Wanna Buy a Duck devoted April to ballroom dancing. While that sort of thing, usually, isn't my cup of tea, she really made it interesting and gave me a better appreciation for dance and the work it takes to make it look easy. 4. Tara Tyler Talks: Tara devoted the month to a bunch of great tips for all sorts of things...from writing to cleaning. A lot of very good ideas were shared and her blog was one of my 'must visits' during April. 5. Tyrean from Tyrean's Writing Spot spent April telling us the ins and outs and nuances of the great sport of Fencing. She knew her stuff having trained in it for years and fencing is something I've always wanted to try. Through her theme, I got a taste of what I've been missing. 6. The Capillary had a lot of very cool posts about movies and her reviews of them. Very entertaining stuff and it was fun to check out each day. Definitely one of the blogs that I thought should have gotten more love. 7. The Write Game: Lee had a great theme where she taught us a different word each day. Now, I have a pretty good vocabulary, if I do say so myself, but I found myself learning a few new words in April, thanks to Lee. 8. Gary over at klahanie never failed to put a smile on my face with his "Z to A Challenge". His tongue in cheek theme had some great entries and were, always, entertaining. 9. Sheena over at Queendsheena gave us some insight into her upcoming book release Sacrifice Her. A very interesting and, it seems, harsh tale of angry gods and how the people of Faux City deal with appeasing them. It looks like it's going to be a good one, for sure! 10. Lisa Buie-Collard spent April talking about some of the ins and outs of writing. The lady really knows her stuff and it was, definitely, a topic that interested me during The Challenge. This was another blog I thought deserved more love...she had some good stuff. Thanks again to Nicki and Christine for the awards, I really appreciate the thought! Congratulations on the awards! It's nice to learn a little more about you. I think the 40s were a pretty neat era, too! Congrats on your awards. And thank you for the nice shout-out. Your #10 and 11 are my favorite too. H Mark .. so early you wanted to be a cartoonist, and a syndicated one at that! .. and bundle of relief I'd say for your mother?! ... large bouncing baby you must have been ..
Well when you get to London .. give us a buzz! See you then ..
A friend of mine gets Bic Macs with "white mac sauce" AKA tartar sauce. She says it's amazing. I've never tried it. Congrats on the awards! I just recently got a Liebster and also "cheated" on the giving it away part LOL. We had a lot of similar answers. All through school people used to call me Darkwing Duck because my initials were DW. Darkwing Duck! Now there's somebody I haven't thought of in years. I have to wear a mouth guard too. Maybe writers are just generally stressed out? It's NEVER too late to find love. Don't think I'm weird but a "feature" that I find appealing is smell. Men HAVE to smell appealing. And I'm not talking about being sweaty, or working out. Everyone has a base smell, though it is often influenced by sweat, dirt, laundry detergent, lotion etc, that base smell has to be attractive. I read somewhere that the only way to get a six-pack of abs is to cut out bread and sugar while exercising. Congratulations and thanks, Mark! Jeremy awarded me it before, so I will just graciously accept it. Josie - that made me chuckle. And you are now officially Darkwing Mark. 4 and 9 from the facts about you, me too. Congratulations, Mark! Nice to get to know more about you. @Celeste: Yes, she reminds me of that fact ALL the time...lol. @Hilary: Oh yeah...I was a real porkchop :) And, yes, if I ever make it 'across the pond', I'll definitely look you up! @Elizabeth: Strangely enough, one time they gave me a Big Mac with Filet o'Fish tartar sauce instead of the 'special' sauce on it and it -was- delicious. Something worth trying, imo. Congrats on the awards Mark, you truly deserve them. Darkwing Duck huh? Is it nerdy that I immediately recalled the theme song? Ahhh! I can't believe I made it into your top ten, there were so many awesome A-Z posts out there. Thank so much. And your theme rocked Mark, you definitely worked hard on it. Congratulations on the awards. In my opinion, you're definitely right to opt for Sweeney Todd! Your facts were interesting. Some I knew (like the migraines). I, too, tend to grind my teeth. I have tried the mouth guard, but I cannot wear it. I always end up pulling it out during the night. I simply cannot sleep with that thing in... even though it was fitted for MY teeth. Aaacchhh. And I also love Native American cultures. I went through a period when I did a lot of reading on the subject. Congrats on the 2 well deserved awards, Well done. Congratulations on your awards! 1940's was an interesting decade to be sure, but permanently living in it might be a little scary from my perspective. I don't envy the takers of your Liebster award...you asked some really tough questions there. @Yvonne: Thank you very much! I love that you remember your first crush and she was from Josie and the Pussycats. Darkwing Duck, too :) Nice. And I don't blame you for not picking 11 bloggers, that takes forever! I love that you chose Nick and Nora as your romantic couple. Congratulations on your awards! I think it is smart to choose a super hero name that doesn't give away your power. As the gal says in the Despicable Me 2 preview, don't announce your weapon before you use it. Congrats! I grew up in Oregon and lived for four years in New Mexico, and I loved being surrounded by Native American culture. A wrestler? I love it. What would your WWE name be? I must know!! PS I believe you commented on my O is for Octopus post promising you would tell me all about your jellyfish story? I didn't forget. And I'm waiting (not so patiently) to hear it...tick tock. @Shell: I follow so many great blogs that picking just 11 is tough! @Diane: Oh definitely and one of the reasons I'd love to visit New Mexico. 2 both times was cute. Also loved your third fun fact. This was fun to read, Mark! Congrats on your awards! Came over from Jeremy's place. Saw you all over the Challenge comments as I made my rounds - good visiting there Mr. Minion! Very fun facts. I know some people don't like awards...but I love 'em and the personal stuff you "have" to do to accept them. Wow WebTV! I guess it really did work! Congrats Man! Someone told me to try to get WebTV since I lived so far in the country, but I didn't. Congrats on the awards, Mark! You deserve them. Thanks for playing along & accepting your award. :) I think I just might give that tartar sauce a whirl sometime. Thanks for highlighting these blogs - makes me sad I didn't do A to Z...though that doesn't stop me from checking out a few backdated posts, does it? I've heard a lot of fellows say they had crushes on girls from Josie and the Pussycats. I've always been curious about the show since. Ack! I can't believe I missed Tyrean's A-Z. She did fencing?! I will have to go and read all the old posts. Ah yes, well done on having those two awards bestowed upon your good self. I like your responses to the Lobster Award, or whatever it's called :) I share your love for the culture of the First Nation's people. Oh wow and thanks, Mark. To have myself included in such an elite group of alphabeter's, has truly left me flattered. Very kind of you to include me considering I didn't participate in the darned thing :) Anyhow, duly noted and I shall try to formulate a posting in regards to this. Thanks for reminding me. I've got some awards to make note of that have been given to be my by um adoring fans. Be well, Mark and thanks again. @Nicki: My pleasure and thanks again for thinking of me...I appreciate it :) Yes, you should try tartar sauce..you might be surprised at how much you like it...or you might hate it, in which case, I can't be held responsible :P Well, there's always next year for A to Z, right? Great picks for your favorite blogs from the Challenge! 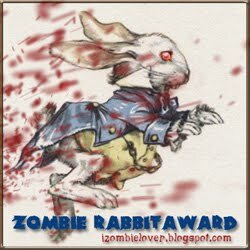 (I think the award is a zombie because it originated with Jeremy from Retro Zombie.) London is also top on my list for travel destinations. Will I make it there in this lifetime? I have no idea. Not any time soon. Well I have to ask, Mark! How are you like Darkwing Duck? totally intrigued by other posts and forgot to scroll down to this one! thanks so much for the award and for visiting so much! ew! but thanks!